Coal mining activities may cause a series of environmental and socio-economic issues in communities around the mining area. Mining can become an obstacle to environmental sustainability and a major hidden danger to the security of the local ecology. Therefore, the coal mining industry should follow some specific principles and factors in achieving sustainable development. These factors include geological conditions, land use, mining technology, environmental sustainability policies and government regulations, socio-economic factors, as well as sustainability optimization for post-mining land use. Resources of the remains of the coal which is defined as the last remaining condition of the resources and reserves of coal when the coal companies have already completed the life of the mine or the expiration of the licensing contract (in accordance with government permission). This research uses approch of knowledge-driven GIS based methods mainly Analytical Hierarchy Process (AHP) and Fuzzy logic for utilizing coal remaining resources and post-mining land use planning. The mining area selected for this study belongs to a PKP2B (Work Agreement for Coal Mining) company named Adaro Indonesia (PT Adaro). The result shows that geologically the existing formation is dominated by Coal Bearing Formation (Warukin Formation) which allows the presence of remains coal resource potential after the lifetime of mine, and the suitability of rubber plantation for the optimization of land use in all mining sites and also in some disposal places in conservation areas and protected forests. Agterberg, F.P., Bonham-Carter, G.F., Wright, D.F., 1990. Statistical pattern integration for mineral exploration. In: Gaal, Gabor, Merriam, Daniel F. (Eds. ), Computer Application sin Resource Estimation Prediction and Assessment for Metals and Petroleum. Pergamon Press, Oxford. Brundtland, 1987. Our Common Future, World Commission on the Environment and Development. Carranza, E. J. M., 2009. Geochemical Anomaly and Mineral Prospectivity Mapping in GIS. Handbook if Exploration and Environmental Geochemistry; Vol 11. Elsevier, UK, 351 p.
Craynon, J. R., 2011. Approaches And Barriers To Incorporating Sustainable Development Into Coal Mine Design, Doctoral Dessertation at the Faculty of the Virginia Polytechnic Institute and State University. De Carvalho, J. J. A., Koppe J.C., and Costa, J. F. C. L., 2012. A case study application of linear programming and simulation to mine planning. The Journal of The Southern African Institute of Mining and Metallurgy, Vol. 112. Friedrich, W. and Becker-Platen, J. D., 2007. Global Nonfuel Mineral Resources and Sustainability, Proceedings for a Workshop on Deposit Modeling, Mineral Resource Assessment, and Their Role in Sustainable Development, Circular 1294, p. 1-16. Hunt, J.W., 1988. Sedimentation rates and coal formation in the Permian basins of eastern Australia. Australian Journal of Earth Sciences 35, 259–274. José A. B, Ronald R. G. and Martin L. S., 2011. A Methodological model to Assist in the Optimization and Risk Management of Mining Investment Decisions, Dyna, year 78, No. 170, pp. 221-226. Kementerian ESDM, 2009, Undang-undang No. 4 /2009 Tentang Mineral dan Batubara. Kementerian ESDM, 2006, Perpres No. 5 /2006 Tentang Kebijakan Energi Nasional. Liu H., Changxie, Y. E.; QI Xin, 2012. Study on Developing Coal Resource with the Social-Economic Influence in Erdos City. Cross-Cultural Communication, Vol. 8, No. 6, pp. 112-117. Partington, G. A., 2009, Commercial Application of Spatial Data Modelling with Examples from North Queensland, AIG Northern Queensland Exploration and Mining Conference 2009, Townsville, Australia, 3-8 June. Rohrbacher, T. J., James A. L., Osmonson, L. M., and Carter, M. D., 2009. Coal Resource Availability, Recoverability, and Economic Evaluations in the United States—A Summary. The National Coal Resource Assessment Overview (USGS Report). Saaty, T. L. 1980. The Analytic Hierarchy Process: Planning, Priority Setting, Resource Allocation., McGraw-Hill, New York. Setiabudi, B. T. dan Hutamadi, R., 2003. Kebijakan Konservasi Bahan Galian Dalam Pengelolaan Sumberdaya Mineral Di Indonesia. Kolokium Hasil Kegiatan Inventarisasi Sumberdaya Mineral – DIM, p. 1-10. Sikumbang N. dan Heryanto R., 1994. Peta Geologi Lembar Banjarmasin 1712, Kalimantan, sekala 1:250.000. Pusat Penelitian dan Pengembangan Geologi (P3G) Bandung. Sharma, P. D., 2009. Bringing Sustainability in Coal Mining Operations is need-of-the-hour. Schmitt, E., 2010, Weights of Evidence Mineral Prospectivity Modelling with ArcGIS. EOSC 448 Directed Studies, Dec. 2010. Shields, D. J., 2007. The Contributions of Geologic Information to Economic, Social, and Environmental Sustainability, Proceedings for a Workshop on Deposit Modeling, Mineral Resource Assessment, and Their Role in Sustainable Development. Circular 1294, p. 17-18. Standar Nasional Indonesia (SNI), 2011. Pedoman Pelaporan, Sumberdaya dan Cadangan Batubara. Badan Standardisasi Nasional (BSN), 2011. Sutcu, E., 2012, Use of GIS to discover potential coalfields in Yatagan–Milas area in Turkey, International Journal of Coal Geology, 98 (2012) 95–109. Suyartono, 2004. Good Mining Practice: Konsep tentang Pengelolaan Pertambangan yang Baik dan Benar. Cetakan ke 2, Studi Nusa, Semarang. Wang L. P., 2008. Countermeasures Study on the Sustainable Development of Coal Industry in China. International Journal of Business and Management vol. 3, No. 6. Wang X. and Zhang G., 2008. Study on the Sustainable Development of Henan Coal Industry under the Guide of Circular Economy,International Journal of Business andManagement vol.3, No.6. Watson, D. W., 2002. GIS Assessment of Remaining Coal Resources with High Market Potential, Conference Proceeding ESRI, San Diego, CA. Zhen W., Yuanyuan, L., Yan Xu, 2008. The Problems in Sustainable Development of Resource Orientated City and Countermeasures, International Journal of Business and Management. Vol. 3, No. 6, June. Yudi D., Rina Z., Catur P., Rini S., Agus S. dan Achmad M., 1999. Studi Regional Cekungan Batubara Wilayah Pesisir Tanah Laut – Kotabaru, Kalimantan Selatan. Pemaparan Hasil Kegiatan Lapangan DIK-S Bataubara, DSM, 1999. Yufen H., Yunxia W., Sumei Z., and Lihong C., 2013. Integrated Evaluation of Ecological Sustainability of a Mining Area in the Western Region of China. International Journal of Environmental Science and Development. Vol. 4, No. 2, April. 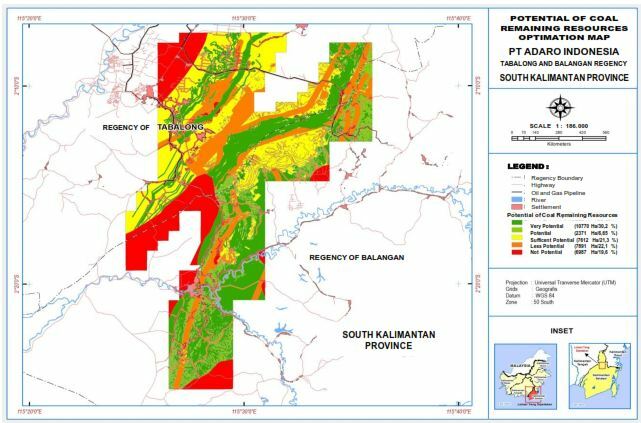 Geology Kalimantan Selatan [WWW Document], Dinas Energi dan Sumberdaya Mineral Prov. Kalsel, www.prov.kalsel.go.id (accessed 10.30.00). ANIS, Mohamad et al. Utilizing coal remaining resources and post-mining land use planning based on GIS-based optimization method : study case at PT Adaro coal mine in South Kalimantan. Journal of Geoscience, Engineering, Environment, and Technology, [S.l. ], v. 2, n. 2, p. 141-148, june 2017. ISSN 2541-5794. Available at: <http://journal.uir.ac.id/index.php/JGEET/article/view/307>. Date accessed: 20 apr. 2019. doi: https://doi.org/10.24273/jgeet.2017.2.2.307.